Do you want to rock down to 50 Electronic Avenue? This development, built on the former location of the only TV manufacturing plant in BC, offers unique urban living on a historic street in Port Moody. 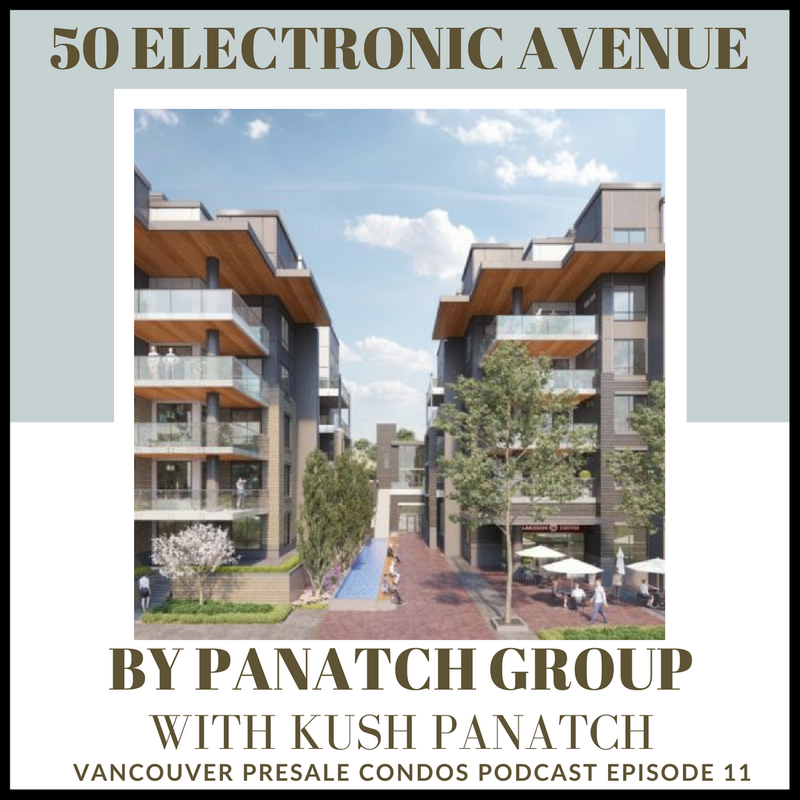 Expertly crafted by the Panatch group, this amenity rich building offers a collection of 358 condominium residences, featuring spacious 1, 2, 3, and 4 bedroom floor plans. Just steps away from Brewers Row, Rocky Point Park and two Skytrain lines, this is Port Moody living at its finest! It’s located where the only TV manufacturing plant ever built in BC once lived in the 60’s, which is why it’s called Electronic Avenue. It’s a mix-use project that will be completed in two phases. Both phases are six storeys tall. The ground floor is about 18,000 square feet of commercial space with 138 homes on the top five levels. It’s a wood frame building offering some unique amenities. Let’s talk amenities/features; what makes it unique? There’s a community feel in Porty Moody and an amenity rich building is wanted. We have a 9000 square foot amenity building with your typical amenities like a fitness centre, lounge and kids’ play area. But we also created something special for the neighbourhood, a co-working space. This area with desks and private meeting spaces will serve those who work from home or who are starting a business. The City of Port Moody really liked our co-working space idea. So we’re actually donating some of our commercial space, 2500 square feet, to the city and calling it the Port Moody Hub. This will be a co-working space for the larger community, not just residents of the buildings. There’s also potential to put in an art gallery or host a tech start-up. People are looking for that transition space. They want to work from home but they still want a professional environment. Many young people are unable to get into the real estate market so this program provides them a pathway to ownership. We will have 30 homes available to residents of Port Moody for this program. People will rent the home for two years at an affordable rate. At the end of the two years, all of that rent they have paid will be applied to the purchase price of the home. And the purchase price will be fixed at the beginning of the two years. Port Moody has seen a lot of big changes in the last ten years. But it’s still a community and there’s a sense of home. It’s close to Vancouver and you can easily access the amenities of a bigger city, especially with the Evergreen skytrain line. It’s a small town feel but amenity rich. The property is very family friendly with 1, 2, 3 and 4 bedroom units available. All of our units are larger than what you would find in a typical condo building. We’re finding many people want to move into a condo but don’t want to give up the space and comfort of a home. We’re still in the early stages of development so don’t have pricing finalized yet. But we know there is lots of demand in Port Moody and that many projects are selling out quickly. We want to be in the market by the end of the year and our sales centres are opening soon. We’re planning for the first phase to be completed 18-24 months from then and the second phase following that. We’re a small scale developer. We’ve mainly developed townhomes and mix-use projects in Richmond. 50 Electronic Avenue will be our largest project to date. We’re a family owned operation and we only take on one project at a time. That means we’re fully invested and put a lot of time and effort into each project. Who is 50 Electronic Avenue for? Primarily for end-users. From other developers in Port Moody we’ve learned there are more end-users than investors. But we have gotten some interest from investors. For example, we have had inquiries from some empty nesters looking to invest in a property for their children. Why should someone buy at 50 Electronic Ave? It’s in a central location. 50 Electronic Avenue is across from Rocky Point Park, within walking distance of two skytrain stations and next to Brewery Road.